Today YouTube implemented some changes that make everything harder for video creators who have yet to reach a wide audience. 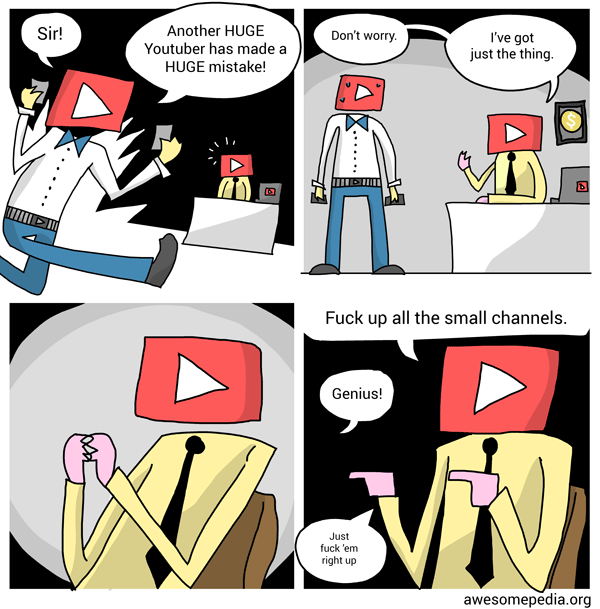 YouTube has recently had a lot of problems with what I'm sure they consider their "top tier" creators and instead of dealing with that, and dealing with how their flawed algorithm encourages the creation of despicable content, they've decided to stomp down smaller creators. They looked at the grassroots of their platform, the foundation they stand on, and decided to rip those grassroots out. Cool. Also hey I made a comic, that's cool. Been a while. How do we fix Game of Thrones? This is a video essay about the writing in season 7 of Game of Thrones, so there are SPOILERS! 1. Kill Bronn: The loot train attack is awesome but there's no real price paid on either side - nothing changes by the end of the battle! I think Bronn should die because 1) the events would feel like they had actual weight, and there's too many fake deaths 2) his demise would mark the end of the light-hearted fun times of GoT and 3) It would be a great turning point for Tyrion, who should have started the season full of anger and been tempered by the death of his friend, instead of just wanting the same thing all season. 2. Capture Jamie: Stakes and consequences used to be so central in GoT, so when Jamie decides to ride at a dragon it should result in him being captured, at the very least. He could have the canon scenes with Tyrion except in chains at Dragonstone, and his scenes with Daenerys would have been interesting since he murdered her father, though people are pretty quick to forgive that sort of thing these days. Coming face to face with Daenerys would mean confronting his past, and it could cause him to alter his present. Having Bronn and Jamie both escape in such an unlikely way undermines the cool scenes that the show is otherwise so great at crafting, in my opinion. 3. Fix Tyrion's Dumb Plan: Going north of the Wall never made sense. They wanted the Night King to get a dragon and there are better ways of doing it. The point of the plan was to convince Cersei, but instead the point should have been to convince Daenerys. She makes a deal with Jon - "I'll burn these frost ghosts of yours and you bend the knee". She has good reasons to be over-confident and dragon-fire has solved all her problems in the past. So they fly north on a dragon and get shot down. This way, Daenerys' over-confidence is the reason her dragon dies, and she's forced to face her own mortality. It would give her more of an arc than just falling for Jon Snow faster than Viserion fell into the ice. I don't think I'm some genius who could have done it better but these are fun possibilities to play around with. Do you agree with these changes, or do you have other suggestions of your own? Why was an Austin Seven hung under the Bridge of Sighs in St John's College Cambridge in 1963? This video tells the story of the legendary car prank, from someone who was actually there - my father! It also tells the story of Brian Burrows, opera singer, tenor, and a daily inspiration to me and all. I made this video for my dad's birthday on May 4th, 2017. Switch on captions in case you have difficulty hearing it all! There are a lot of details I did not have time to go into in the video: My father has been a computer programmer and an English teacher, taking over after William Golding. As a child he was in the original performance of Noye's Fludde by Benjamin Britten, playing the lion. And that beard he had in Tom Jones at Drottningholm was totally real! This is my VERY punk version of We Didn't Come Here To Rock by Andrew Jackson Jihad. Technically it's an "AJJ cover" and not an "Andrew Jackson Jihad cover" since they changed their name, but I just found out about that today and I'm not ready for that change! Recorded this with my electric guitar (first guitar video ever!) and broken microphone vocals. Well I considered the microphone broken but then it got A LOT MORE BROKEN as you'll see at the end of the video. I mention my band Total Misär - you can watch our live cover of American Girl by Tom Petty, and there's also my Westworld song that someone said sounded like AJJ. On the video page there are lyrics and chords for this song. I recorded a ukulele and xylophone cover of Tally Hall's Hidden In The Sand, off their album Marvin's Marvelous Mechanical Museum, which I used to listen to a lot. The song shuffled into my ears as I was walking the sand and ice, and I hurried home to record it, trying to beat the setting sun. The chords are available below! Consider subscribing over on YouTube if you enjoy this and want more like it! Tally Hall is a band I listened to ages ago - I made fan art for them, I recommended their web comedy show to anyone who would listen, and I even re-made their music video Good Day, putting my face in all the screens instead of theirs, so it's safe to say they were an influence on me, but I never did a cover until right now! I didn't go into a lot of detail in the video so here below are some instructions. Please ask questions if anything is unclear! I downloaded the photos using an addon called DInstagram. Honestly I don't know why they make it so hard to download photos, it would have saved me a lot of time if I could just get ALL of them in one go and go through them on my computer. Those tiny notebooks had a lot of pages so I printed a lot of pictures. A lot of the pictures weren't too high quality but luckily that didn't matter since I was printing them so small (and on such a crummy printer). Had to use Adobe Bridge to generate a PDF where they were the right size, which was 3.4 x 3.4 cm. Then I simply cut them up and glued them in. When I was done I put a pile of history books on top of it to make sure the pages didn't get all wrinkly, but this was probably a bad move since it contributed to the colours bleeding together. If you attempt this, leave the book open instead and let it dry out properly - as you see in the video I have some problems with the pages sticking together too. I'm really terrible at this haha! The song in this video is "Before I Sleep" by Maciojad. This video was shot with a Panasonic GH4 and a 14-42mm f/3.5-5.6 lens. In this improv comedy game we create new TV shows from scratch, taking the title of a real show with a one word title - this time it's Outcast, Baskets, Grandfathered, Vinyl and Preacher - and making up our own TV pitches based on those titles. This is the fourth and probably final part, thank you for watching! Subscribe to the Awesomepedia youtube?? This ukulele song is about Westworld theories! Reddit has theories on Arnold, Bernard, Dolores, William, The Man in Black... It was too much! This song is my allergic reaction! I first played it on the Westworld episode 6 discussion on my TV podcast Shows What You Know, but the lyrics are all speculation and NO SPOILERS. This video is getting some love over on reddit, so this is probably a great time to subscribe to my youtube channel so you can say you did it before it was cool. Wow I just realized I haven't promoted Shows What You Know at all here on the site, just on the Facebook group, Twitter, etc. Yeah I'm doing a TV podcast, in case you didn't know, and there's a LOT of episodes about Westworld. Also my other podcast Hello There is not showing up on the start page either at the moment, but there are new episodes on Fridays over at awesomepedia.org/podcast! Here is the new One Word Titles video, where we guess/hilariously improvise what TV shows are about based only on their titles. This time we tackle Benders, Colony, Tripped and Rosewood! We shot this 6 months ago but I didn't finish editing it until the other day when I realized our hilarious Butterfly Trump joke might (hopefully) be totally irrelevant in a couple of days. Subscribe to the youtube if you want. A video where I go through the things I got while visiting Mexico this September/October. I felt a bit bad doing just a classic haul video without any sort of unique twist or anything, but I just got so much stuff haha! Don't you love to consume things, I sure do. Subscribe for more haul videos jk I probably won't do this again it was a heck of a lot of work. Come with me Down The Rabbit Hole and plunge into a world of werewolf spells and Jesus memes! If any werewolves found this video, please note that I'm not here to judge, I'm only sharing and shining a helpful light. Kind of like the moon. By the light of the moon and our piercing howls from the circle of life to the evolution of man I shall be reawakened as one with the land.